Issues: Rewrite Settings and Areas to contain anchor links to room names. The Mysterious Tower is a world in Kingdom Hearts II, Kingdom Hearts Birth by Sleep, Kingdom Hearts 3D: Dream Drop Distance and Kingdom Hearts III. It is the home of Master Yen Sid, and serves as a starting point for Sora and Mickey's quests in Kingdom Hearts II and Kingdom Hearts Birth by Sleep, respectively. It is a unique world that doesn't always remain in one place, so although it is considered part of Twilight Town in Kingdom Hearts II, at other times it appears on its own. In Kingdom Hearts II, the Tower resides in a secret area of Twilight Town, accessible only by a special train that only appears sometimes in the Central Station. 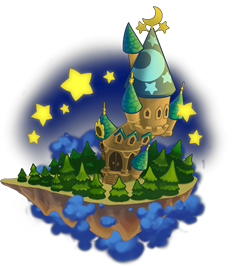 The Countryside itself consists of several hills apparently floating amongst the clouds in the endless sunset of Twilight Town, with several stars gleaming in the background. Other than the hills and the tower itself, the only physical existence in the Countryside is a glowing railway along which the single train rides. The Tower itself is a surrealistic, crooked, golden-brown tower, loosely based on the setting of Fantasia's The Sorcerer's Apprentice. 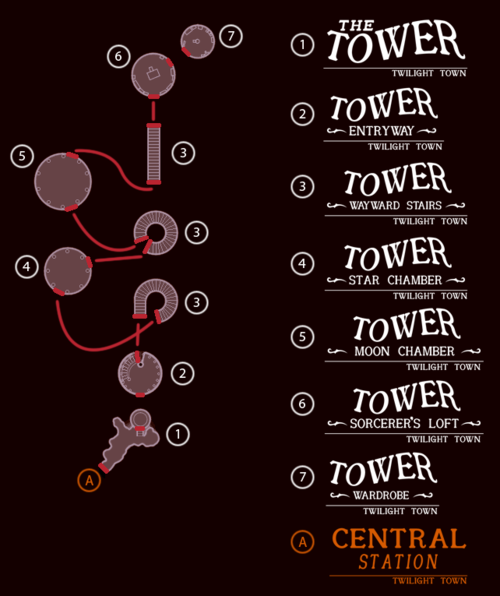 Though it appears to be missing several key structures from the movie, such as the well and the basement study, it appears that the segment is canon to the Kingdom Hearts storyline, and this tower is where it takes place. The Tower is topped with blue cone-shaped turret roofs, decorated with moons and stars, similar to Yen Sid's hat. It rests on a floating island that contains a courtyard and many trees that obscure the rest of the Countryside from view. Inside the main door is the Entryway, surrounded by an upward-spiraling staircase that leads to a strange portal. Through the portal, a person is transported to the Wayward Stairs, a transitioning room where stairways connect the various rooms of the tower via portals. Other than the entrance, stairs, and upper floor, there are two known rooms in the Tower. One is the Moon Chamber, and the other is the Star Chamber. Both are perfectly round rooms, each with two doors leading either up or down the Tower, and are decorated with moons and stars, respectively. The final stairway is steep and straight, and leads to Yen Sid's Study. Yen Sid's study, the Sorcerer's Loft, is the largest room in the building, with several shelves containing many books, several about the exploits of King Mickey. There is a large wooden desk behind which Yen Sid sits, and behind it, large star and moon windows displaying the Countryside. A door on the side of the study gives way to the Wardrobe, where the Three Good Fairies, Flora, Fauna, and Merryweather, apparently stay. There is also a large wardrobe, and several covered mirrors that display Sora in his drive forms, including AntiForm and Final Form. In Kingdom Hearts Birth by Sleep, the portals to the other rooms make no appearance and the Wardrobe Room is inaccessible. The same three playable areas of the world in Kingdom Hearts Birth by Sleep are playable as part of Symphony of Sorcery in Kingdom Hearts 3D: Dream Drop Distance. One major difference is Yen Sid's chamber giving Sora and Riku access to the musical realm through the musical scores. In the storyline cutscenes of the real tower, only the chamber and countryside are shown. During Kingdom Hearts Birth by Sleep, The Mysterious Tower is first seen at the beginning of the game. Mickey is shown riding a book over waves of water, before being sucked down a whirlpool. Suddenly, the water disappears and Mickey appears in Yen Sid's study. Yen Sid looks disappointed, before saying that he senses that something horrible is about to transpire. Terra is the first of three Keyblade wielders to visit the tower. After learning that Master Xehanort is in a battlefield wasteland from the Magic Mirror, Terra goes to see the former Keyblade Master, Yen Sid to gain more information. As he arrives, he sees Mickey disappear into a flash of light from his Star Shard. Terra continues to go see Yen Sid. Yen Sid sensed Terra's arrival and Mickey's departure as he can sense the movements of Keyblade wielders. Yen Sid says he feels that the Unversed and Xehanort may be connected and sends Terra back on his search for Xehanort. As the young man leaves, Yen Sid asks himself if Xehanort still has "distracting thoughts". Ven appears here accidentally by the Star Shard while visiting Neverland. As he lands, Donald and Goofy are sitting outside wondering where their King has gone. They at first mistake Ven for the king but then take him upstairs to Yen Sid. The old man notes that Eraqus ordered Ven to return home, but says Ven is just like Mickey that way. Ven says that he does not know where Mickey is, so Yen Sid finds him. He shows Ven, Donald, and Goofy an unconscious Mickey in the Keyblade Graveyard, abducted by Master Xehanort. Donald and Goofy prepare to venture out to save Mickey, but Yen Sid persuades them otherwise, knowing that they are no match for Master Xehanort. In the end, Ven goes alone, to repay his debt to Mickey for saving him earlier. Aqua comes here after finding Mickey unconscious in the space between worlds. She flies him to Yen Sid, and while Donald and Goofy try to wake him up, Yen Sid tells Aqua of Eraqus' defeat at the hands of Terra. Aqua furiously denies that Terra could do that. Yen Sid hopes this as well, but tells Aqua to find the truth by talking to Terra himself in the Keyblade Graveyard. She leaves with Yen Sid warning her to be careful. After Aqua's showdown with the Vanitas-possessed Ventus, Mickey brings the two bodies to The Mysterious Tower. However, Ven is unconscious, stuck on the border between light and darkness. Yen Sid tells Aqua that she must believe in her friends to save them. If she treasures the bonds she shares with Ven, he will be led back to light. Mickey agrees to believe in Ven too, and Aqua says Terra will too, when she finds him again. Until then, Aqua departs with Ven to find a safe place for him to sleep. Following Terra-Xehanort's defeat, a dejected looking Mickey, standing beside Donald and Goofy, places his Star Shard and Keyblade on Yen Sid's desk. As he turns away, Yen Sid returns it to him, as the King raises it in pride. Sora meets Pete for the first time. After Sora awakens from his year-long sleep in the basement of the Old Mansion, he meets briefly with King Mickey, who gives him munny and tells him to take the mysterious train to Yen Sid. After being seen off by Hayner, Pence, and Olette, the three take the train and arrive at the base of the tower. Getting off the train, the trio meet Pete, who is loitering outside after sending in Heartless to attack the Tower's master. Due to the tower having changed its location since the events of Kingdom Hearts Birth by Sleep, Donald and Goofy are unfamiliar with the tower and are startled to hear that Yen Sid resides there. The three hurry inside to meet the King's tutor, leaving a bewildered Pete behind. They make their way to the top, slaying Heartless on their way up, and eventually reach Yen Sid. The sorcerer gives them a book that summarizes all three games, and gives them information about the Nobodies and Organization XIII. He and the good fairies also give Sora his new outfit and drive form abilities, and returns the lost Gummi Ship to Donald and Goofy. After the party leaves, Diablo, Maleficent's Raven, arrives with Maleficent's robe that was left in Hollow Bastion. The three good fairies recognize it immediately, and their memories of its owner start to work magic on it and bring Maleficent back to life. She plotted to take over the Tower and announced her return with her trademark laugh. It appears, though, that she failed, as she instead began targeting other castles all over for the same reason, and later, when the player can return to the Tower, there is no evidence that she ever held any sway over it. However, Yen Sid and the Good Fairies are completely absent, and the Tower is overrun by lesser Nobodies. Some time after decoding Jiminy's Journal, Mickey returns to The Mysterious Tower to meet with Yen Sid, who appears to have regained control of the Tower from the Nobodies. They discuss the whereabouts of Terra, Aqua and Ven, as well as the next actions of Master Xehanort, who will be revived due to the defeat of Ansem and Xemnas. Yen Sid orders Mickey to summon Sora and Riku to him to undertake a Mark of Mastery Exam to counter Master Xehanort. Mickey, Donald and Goofy watch Yen Sid prepare Sora and Riku for their Mark of Mastery Exam. Sora and Riku arrive at The Mysterious Tower to undergo their Mark of Mastery exam. Yen Sid explains the history of Master Xehanort to them and assigns them to the Dreaming Realm to awaken several worlds which remained submerged in sleep following the defeat of Ansem. During the exam, Sora and Riku visit a past incarnation of the tower in the Symphony of Sorcery world. Later, Mickey, Donald and Goofy receive a note from Maleficent along with Queen Minnie's crown, summoning them to Disney Castle, but they later return with Lea, who makes a shocking request from Yen Sid. When Sora and Riku ultimately do not return from the Dreaming Realm, Yen Sid sends Mickey, Donald, Goofy and Lea inside, where they help Riku rescue the comatose Sora from Master Xehanort and bring him back to the tower. Riku dives into Sora's heart and successfully mends it, reviving him. At the exam's end, Yen Sid only names Riku as a Keyblade Master, though Sora is still happy for his friend. Riku thanks everybody for their help, and Lea shocks everyone present by summoning his own Keyblade. Sora leaves soon after to continue his training elsewhere, while Yen Sid orders Riku to summon Kairi to him to undergo training with the Keyblade to counter Master Xehanort's new Organization. Riku, Kairi and Mickey speaking with Yen Sid. With Kairi now with them, Yen Sid and Mickey reveal that Aqua was with the king in the Realm of Darkness when they were closing the door, but she sacrificed herself to save Riku from the Demon Tide. As she did not have the help of DiZ or the king, she remained trapped in the Dark Realm instead of joining them in Castle Oblivion afterwards. Yen Sid explains that this information was kept secret to prevent Sora from attempting to rescue Aqua, as there was no safe way to get in and out of the Dark Realm at the time. Gifting Riku and Mickey with new garments from Flora, Fauna, and Merryweather, Yen Sid tasks them with rescuing Aqua. In addition, he informs Kairi that she will be trained by Merlin, alongside Lea. Kairi is initially hesitant to work with Lea, who she knew as Axel, but Mickey and Riku assure her that Lea is on their side. After everyone departs, Sora returns and joins Donald and Goofy in Yen Sid's chambers. Yen Sid explains that Sora has lost most of his former powers due to Xehanort attempting to turn him into the thirteenth vessel for his Organization. As such, Yen Sid directs Sora to train with Hercules, who had also lost the will to be a hero before, in order to regain his former strength. ↑ Kingdom Hearts 3D: Dream Drop Distance Ultimania, Nomura: "In the first place, the worlds in the rift between darkness and light have different rules than other worlds. The Mysterious Tower isn't always standing in a fixed place." Translation via Goldpanner and SQEXGAL. This page was last edited on 5 April 2019, at 22:40.